Craving something warm, delicious, savory and creamy? We’ve got just the thing for you, relatively new to our menu, the Grilled Portobello Mushroom Panini. We start with nutrient-dense spelt bread and pile it with balsamic marinated portobello mushrooms, caramelized red onions, spinach, avocado, and house-made creamy basil pesto spread and cashew cheese (100% plant-based, of course), then we place this masterpiece into our panini press and make magic. Try it, you won’t be sorry! Yum, yum, yum! What's not nutritious about this sandwich?!? It's packed full of plant-based protein, fiber, B vitamins, and vitamin C, so eat up! This isn’t your tea-time cucumber sandwich. Rather, our Cucumber Sandwich is jazzed up with nutty and fiber-rich bread, a shmear of house-made cashew cheese, then layered with creamy avocado, crunchy cucumbers, juicy Pico de Gallo, and spinach. Still a simple sandwich, but a Cucumber Sandwich of a different color. 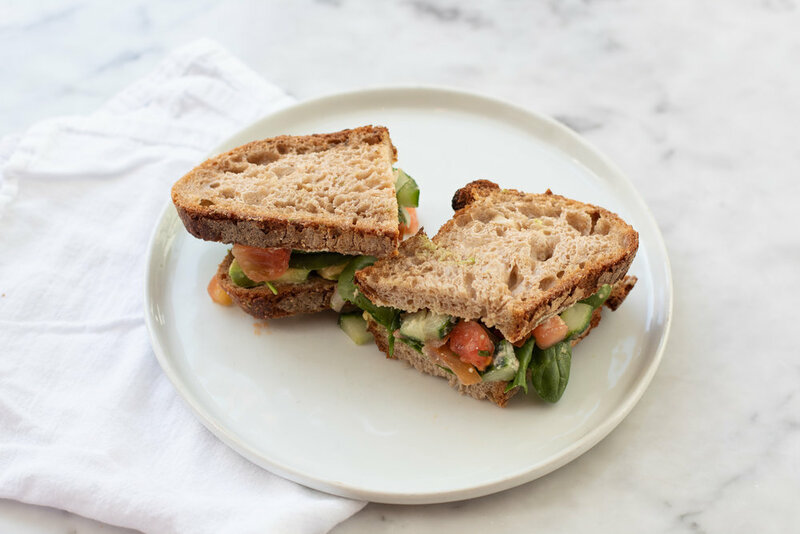 With cucumbers, spinach, and tomatoes, our Cucumber Sandwich is filled with rich nutrients and vitamins, and packed with protein and omega-3 fatty acids. Yum! The Southwest Grilled Wrap is a 100% plant-based, creamy, nutrient-dense, warm, melted and, of course, delicious panini-pressed burrito! We start with a whole-wheat tortilla, shmear on some of our house-made spicy hummus, and then load it up with water-dense romaine, wild rice, fiber-rich black bean & corn salsa, creamy and heart-healthy avocado, vitamin-C-rich red pepper, cleansing cucumber, and lycopene-dense cherry tomatoes. But that’s not all, we then make it even more scrumptious by drizzling on some of our house-made ranch dressing. Lastly, we take it to the panini press, and create a mouth-watering, melted masterpiece! The Southwest Wrap is a perfectly balanced and complete meal, filled with protein from the hummus, complex carbs from the wild rice, heart-healthy fats from the avocado, and fiber from the beans. Delish! The Southwest Grilled Wrap is a 100% plant-based, creamy, nutrient-dense, warm, melted and, of course, delicious panini-pressed burrito! We start with a whole-wheat tortilla, shmear on some of our house-made hummus, and then load it up with water-dense romaine, wild rice, fiber-rich black bean & corn salsa, creamy and heart-healthy avocado, vitamin-C-rich red pepper, cleansing cucumber, and lycopene-dense Pico de Gallo. But that’s not all, we then make it even more scrumptious by drizzling on some of our house-made ranch dressing. Lastly, we take it to the panini press, and create a mouth-watering, melted masterpiece! The Tuscan Kale Grilled Wrap is truly one of a kind! We start with a whole-wheat tortilla, spread on some of our house-made basil pesto mayo (100% plant-based, of course) and house-made spicy hummus, and then load it up with tons of delicious, and definitely nutritious, ingredients – we’re talking kale, quinoa, butternut squash, caramelized onions, broccoli, and chickpeas. The result is an ooey, gooey, warm, melt-in-your-mouth, utterly scrumptious grilled wrap, that’s a definite crowd pleaser! The Tuscan Kale Grilled Wrap is a perfectly balanced and complete meal. Specifically it highlights kale & butternut squash. Kale, being the powerhouse detoxifier that it is, is rich in vitamins A, C, and K, as well as 45 different flavonoids. These rich leafy greens are so nutrient-dense we like to think of them as our all-encompassing healthy greens, supplying us with extraordinary anti-inflammatory and cancer fighting properties, immune support, strong detoxifying and blood purifying properties, and so much more. Plus, butternut squash brings additional vitamin A & C, as well as B-vitamins, benefits. Oh wait, what about the quinoa and broccoli and garbanzo beans??? There's not enough room here to boast about this fantastically healthy wrap!! !